A haibun is a Japanese-derived form in which prose is accompanied by one or more haiku. 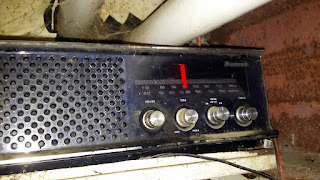 On our dairy farm, the tradition was that whoever arrived earliest at the barn had the right to turn on whichever radio station matched his/her mood or generation. Milkers and cows would work to this music until barn chores were done. After all, scientific literature asserts that cows produce more milk when diverted by music. Are all kinds of music equally beneficial? There was strenuous family debate about this question. Much of the emotional magic of music derives from its familiarity, its links with memory. I don't know that this tie has been tested in cows. But surely it's plausible. Cows, after all, spend much of their lives re-working what one might describe as physiologically recalled memories. Mouthfuls of food are eaten and swallowed, then politely brought back for further consideration. Chewing the cud is the colloquial term, but it might also be labeled bovine nostalgia. The barn radio sits on a high shelf next to a rusty steel beam in the milking parlor. It appears to be tuned to a country music station on a recent April afternoon.